Prathyangara Devi temple at Ayyavadi is situated at around 6 kms from Kumbakonam and around less than a kilometre from the famous Uppiliappan temple. According to legend, when Maha Vishnu incarnated himself as Narasimha and destroyed Hiranyakasibu, he was still furious and seemed to be seething with anger and was uncontrollable. No sages,devas or Gods could pacify Narasimha. At this time Lord Shiva incarnated Himself as sarabeshwara and came down with his consort Sakthi.Sarabeshwara created a goddess with a Lion face and thousands of hands called Prathyangara. Narasimha created a two headed monster bird called 'Ganda perundam' that confroted sakthi Prathyangara. Prathyangara, being a powerful Maha Kali fought and swallowed Ganda Perundam. As soon as Ganda perundam was destroyed Narasimha calmed down. During the Mahabaratha days when the Pandavas were in exile were wandering in the forest near this place. Prathyangara appeared before them. She said to the Pandavas that they will get back their kingdom and all their lost wealth. Pandavas prayed here with the leaves of a banyan tree nearby. The blessed Pandavas eventually won the battle and reclained their lost kingdom. As the five Pandavas came here to worship, the place came to be known as 'Aiyvar (five persons in Tamil) paadi' that eventually came to known as Aiyavaadi. The presiding deity of the temple is Lord Agastheeswarar and his consort is ambal Dharma Samvardini. Banyan tree is the sthala vritcham(sacred tree) of the temple. 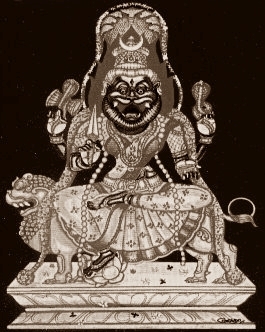 Pratyangaradevi sits majestically around 10 feet tall in a chariot with Her Lion face and 18 hands and holding trident, Pasam, Damarugam( a small percssion musical instrument) accompanied by Lakshmi and Saraswathy on either sides. No abishekams are performed to this deity here. Once a year during the January mid (month of 'Thai') she is anoited with 'punugu' ( a perfume derived from the Civet cat) based oil. This Shiva temple is praised in Thevaram hymns and Saint Gnana Sambandar had praised Lord of this temple in his hymns. The temple is not a big one , has one main praharam. The entrance is regulated through a metal shed with railings to control the crowds during festival days. As you pass through the shed like structure you enter into the praharam. Prathyangira devi is primarily conceived of as a fierce godess capable of extreme rage and destruction incarnated to defeat the evil forces. She is considered to be a powerful force against the effects of black magic, voodoo and also a bestower of many boons to those who worship her with devotion. Significant YagnaThe place itself is considered holy and called 'yagna bhoomi'. (Place where yagna / homam is performed).During full moon day and new moon day a yagna called Nigumbala homam (yagna) is performed. Whoever performs or participates in yagna here are truly blessed and their genuine desires come true. Ill effects because of black magic and all other evil effects are removed if you participate here in the Yagna. Apart from many tins of ghee, cooked rice, flowers, fruits that are offered in the homama /yagna, huge quantities of red chillies are put into the fire. The normally irritating smoke that arises when chillies are put in fire do not affect the devotees here. Temple Timings It is normally open from 8 am – 12:00pm and 4.30pm- 8:00pm. How to reach? 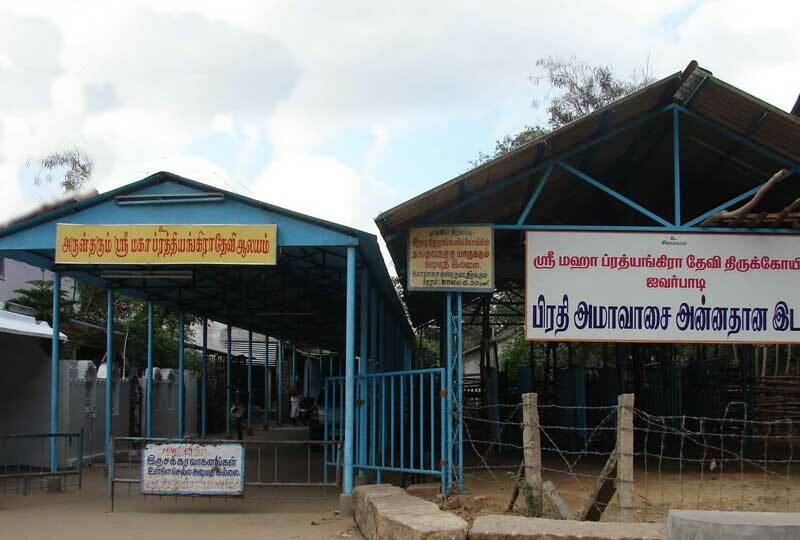 The temple is located 6 Kms from Kumbakonam. Plenty of buses,auto rickshaws,cabs are available from Kumbakonam. Where to Stay?There are plenty of budget and semi deluxe hotels are in Kumbakonam. Contact Manager, Sri Patyangaradevi Temple, Ayyavadi, Thanjavur district. Phone : +91 - 435- 246 3414, 94431 24347.